The NLF460 Replacement Foot for Select Nikon Lenses from NatureScapes replaces the stock foot of your large telephoto lens with this Arca Swiss-style foot for easy attachment to a corresponding quick release clamp. 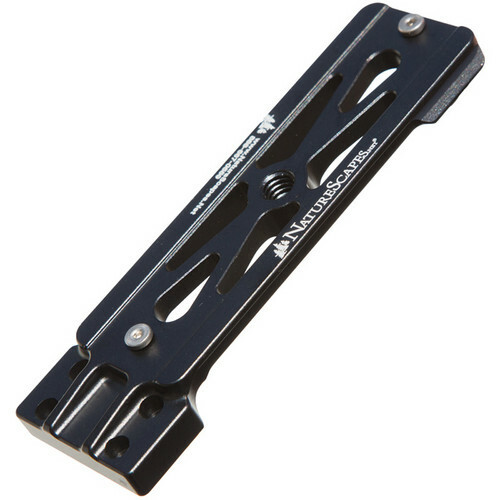 The replacement foot is made of strong 6060 aluminum alloy and provides greater stability and easier removal. Two removable safety screws prevent the lens from sliding out of the clamp in the case of inadvertent loosening. The NLF460 replacement foot is compatible with all Arca-Swiss type heads and is designed to fit the AF-S NIKKOR 400mm f/2.8G ED VR II, 600mm f/4G ED VR II, 800mm f/5.6E FL ED VR, and may fit other lenses. Fits the AF-S NIKKOR 400mm f/2.8G ED VR II, 600mm f/4G ED VR II, 800mm f/5.6E FL ED VR, and may fit other lenses. Box Dimensions (LxWxH) 8.0 x 5.0 x 1.0"
NLF460 Replacement Lens Foot for Select Nikon Lenses is rated 5.0 out of 5 by 1.